I’m pass the stage where I have to feed my ego and crave for adrenaline rush activities. But sometimes, the everyday routine motherhood brings makes me miss doing something fun especially if it’s for the first time. So whenever I get a chance to do an activity that can shake the usual, I take it. Aside from channeling my inner Katniss Everdeen by trying archery for the first time, I challenged myself by trying AntiGravity yoga. 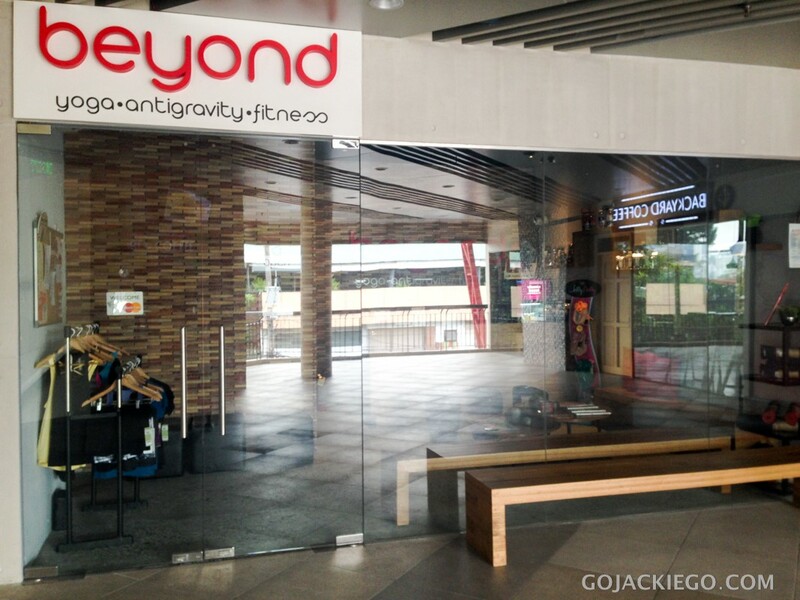 Beyond Yoga recently opened another branch in San Juan City. 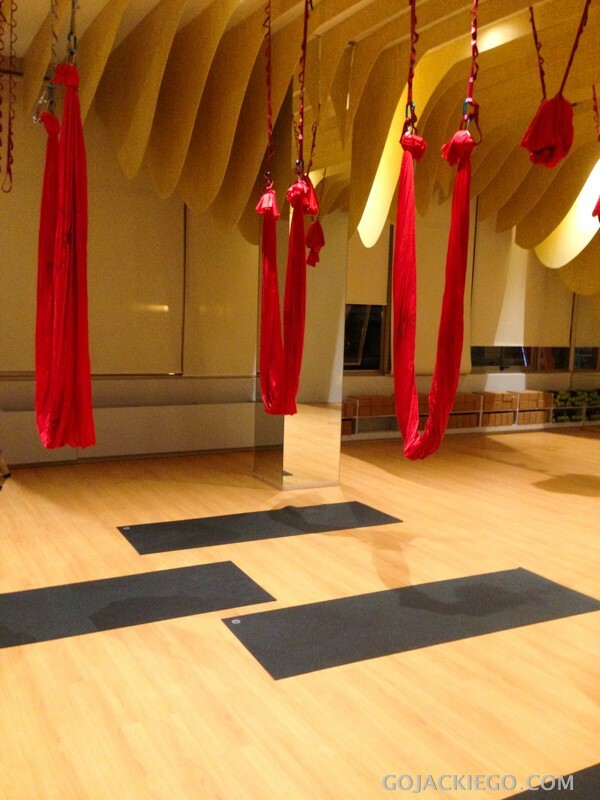 The lifestyle studio offers yoga classes, dance classes (Zumba) and AntiGravity yoga classes. I’m not new to yoga as I’ve regularly attended classes before in another gym. I like it because it helps me focus and prompts me to breathe properly. So the idea of doing yoga while suspended on air was something that got me. For someone who gets really bored easily working out, this is definitely an interesting way to get fit. It looks fun no? I actually haven’t watched the video before I tried AntiGravity. So I was expecting it is something challenging that would take the fun out of trying it. At least for someone like me who wants to get the hang of it for the first time. 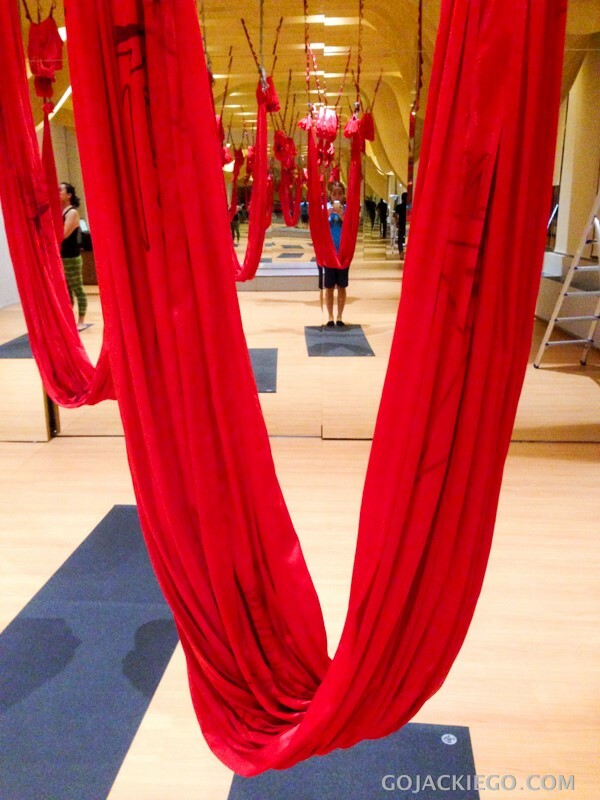 Christopher Harrison is the founder and originator of aerial yoga. He’s a dancer, director and choreographer for broadway and TV productions and have choreographed countless performances in entertainment industry award shows and has directed production for numerous international corporations. Years of experience lead him to launch the aerial fitness technique called AntiGravity Aerial Yoga in 2007. He’s also the inventor of the silk hammock apparatus used for AGY. As I stare at myself in the mirror, waiting for that session’s AntiGravity instructor, I tried my very best to condition myself to let go and just relax. I am such a scaredy cat that trying something new makes me 60 % anxious 40% excited. For first timers AGY Fundamentals is recommended. This class is where you can learn about the basics when it comes to AGY. 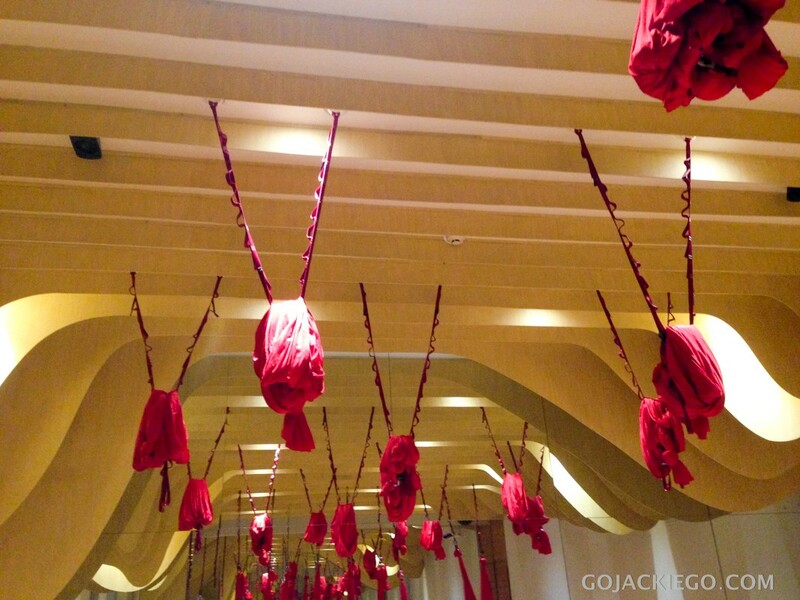 AntiGravity Yoga FUNdamentals offers new students an opportunity to establish a solid foundation in this unique system. This class is designed to give you a secure and detailed understanding of AGY wile having lots of fun. You’ll learn to go upside down with ease and the support of the hammock hold and balance challenging yoga poses, gain better kinaesthetic awareness and develop familiarity with the basic grips, wraps and traps used in an AntiGravity Yoga class. This safe & supportive environment offers all students a fresh perspective on discovering the wide range of benefits of mastering the AGY hammock. After a few minutes of learning the basic, establishing proper breathing, stretching using the hammock, I was surprised that it lead all these preps to my very first AGY pose. Accomplishing something I never thought I could do was definitely rewarding! So I went back again for another session and this time around, I felt like I was a pro even though I was so far from being one. Heehee. I like AGY because it is such a fun fitness activity. It has helped me with balance (since I have onset vertigo), proper breathing, core tightening and has improved the flexibility of my muscles. It doesn’t require repetitive movements but with proper poses, it can help tone your muscles and strengthen your core. I swear the morning after my first AGY session, soreness was present, so that means it worked. 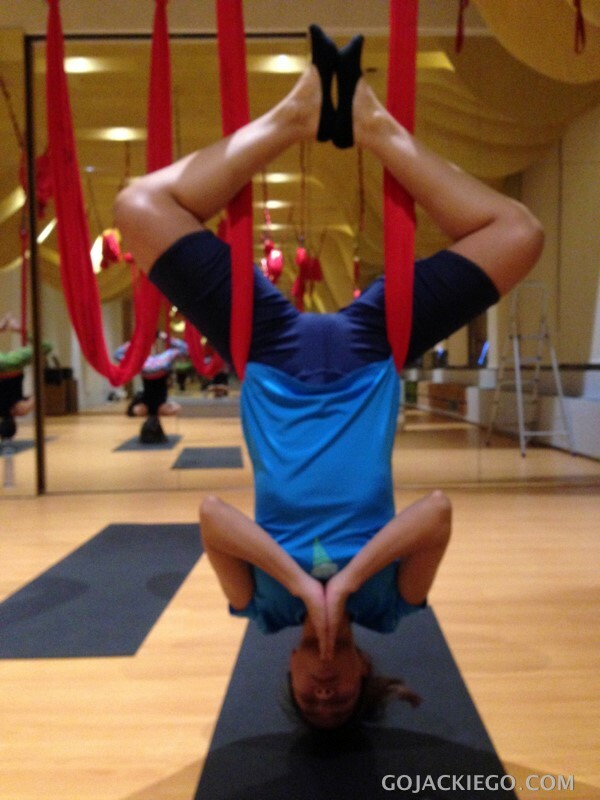 I would recommend AntiGravity yoga to those who like doing yoga but want to try something different and want to add fun in their fitness activity. It’s perfect for those who aren’t flexible as AGY supports your poses. It is also ideal for those who have strong core as it would be easier for you to suspend yourself up in the air. 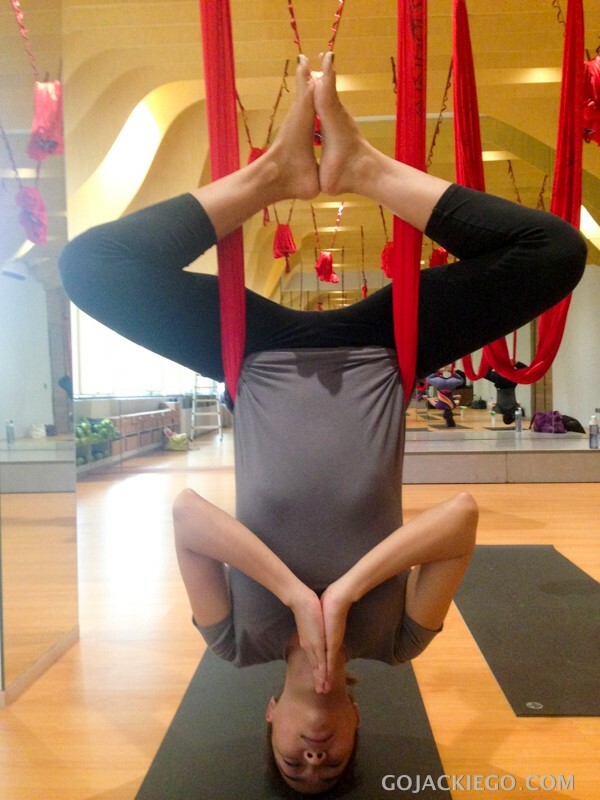 If you want to try AntiGravity Yoga, check out Beyond Yoga’s website http://www.igobeyondyoga.com where you can check rates and class schedules. Oh and remember, wear your workout gear that has sleeves to protect your skin from rubbing against the hammock. Also, refrain from wearing jewellery as it may snag the hammock.